Fruity peach marshmallow pops made with Russian ‘zefir’ marshmallow. If you’ve never tried zefir, you are in for a real treat! This marshmallow is made with agar gelatin, so it sets at room temperature and yields a super fluffy marshmallow. I absolutely love this peach flavor for the summer time! It’s peachy, fruity and delicious! 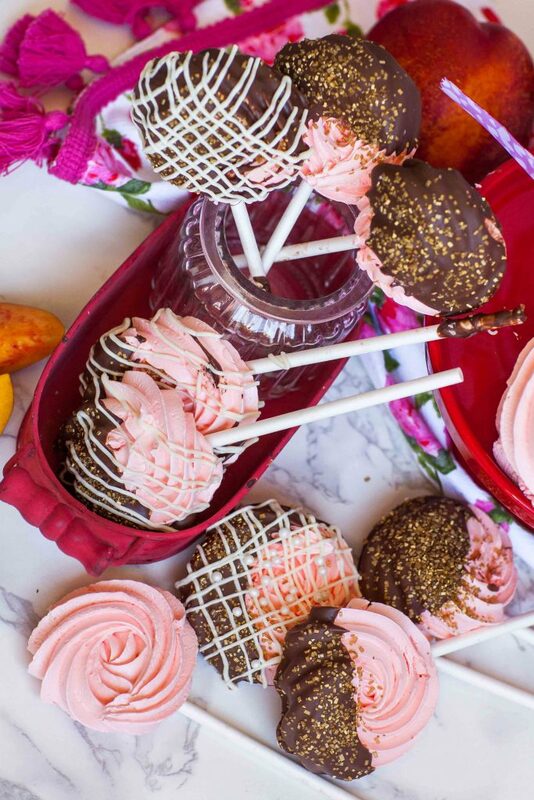 These peach marshmallow pops are super easy and fun to make. They’re perfect for a birthday party, baby shower, bridal shower or any other special occasion! 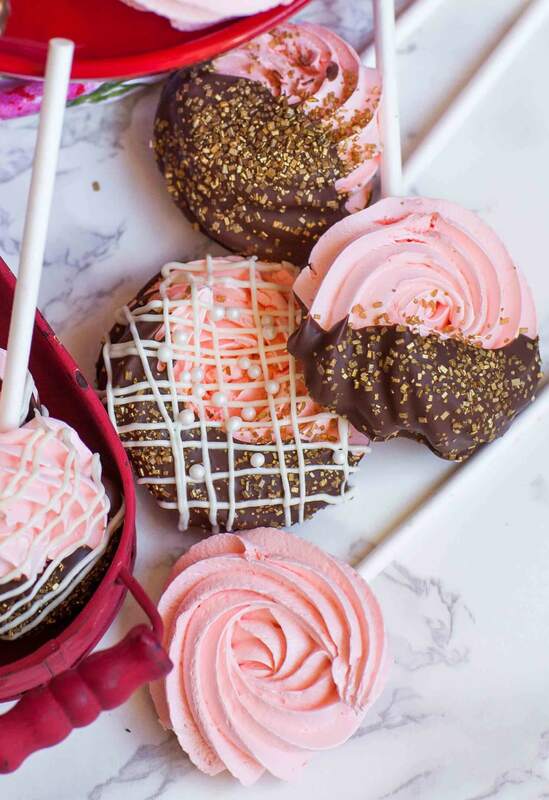 Wrap them into little treat bags and tie off with a ribbon for a cute presentation! You can use this recipe for other flavors, too! I love zefir with raspberry and strawberry. For those flavors, I recommend using flavored J-ello mix. Watch my other zefir recipes for details! Use this set of jumbo cake decorating tips for cake decorating and piping. And don’t forget some disposable pastry bags. I love these silicone mats for baking and for this recipe. I get my agar gelatin online, too. This package will last you a while! Prepare all your equipment first before starting the recipe. Once your marshmallow mix is done, you'll need to work fast as it sets quickly. Line 2 to 3 baking sheets with parchment paper or silicone mats. Arrange the treat sticks on the paper/mats. Prepare a large pastry bag with an open or closed star tip; I used Ateco #847. Place the egg whites into a very clean stand mixer bowl; set aside for now. Pour the peach juice into a small saucepan and sprinkle in the agar gelatin. Cook the mixture over medium heat until it comes to a simmer. Begin adding the sugar gradually, stirring after each addition until the sugar is absorbed. Once all the sugar is added, continue to cook the syrup over medium heat until it reaching its boiling point. Boil the mixture for 2 minutes. When the syrup is almost ready, whisk the egg whites on high speed to soft peak stage. One the syrup is ready, pour it into the mixing bowl in a slow and steady stream, with the mixture running on medium speed. Once all the syrup is added, pour in the lemon juice and add a few drops of food coloring. Turn the mixer up to high speed and whisk for 5 to 7 minutes, until the meringue is super fluffy and begins to set. Quickly transfer the marshmallow into the prepared pastry bag. Pipe generous dollops onto the prepared parchment paper/silicone mats; pipe each dollop over a treat stick. If making marshmallow sandwiches, pipe the second half onto a sheet of paper without the treat stick. Allow the treats to stand at room temperature for 1 hour. NOTE: the marshmallow can be made into simple sandwiches, without a treat stick. Once the marshmallow is piped, sprinkle it lightly with confectioner's sugar. For the chocolate garnish, melt the dark chocolate melts in a tall measuring cup. Melt the white chocolate chips in a separate bowl, then transfer into a disposable bag. Dip each pop half-way into the melted chocolate and set back down onto the paper/mat. Garnish the top with sprinkles, edible pearls and/or drizzled white chocolate. Allow the chocolate to set completely, then enjoy! These look so yummy! How long ahead can I prepare these and how to store them? They’re delicious! I recommend storing them single layer in an airtight container at room temperature; you can layer them with sheet of parchment paper between each layer. They will be good for up to a week if stored properly. what kind of peach juice did you use?